A preserved desert bighorn sheep in the Santa Barbara Museum of Natural History. After a bowl of oatmeal and a pint of coffee I had set out from camp hiking up a remote defile between ragged mountains with two strangers. A narrow, tertiary canyon above a river, it cut deep into the mountain, zigzagging up to the foot of a prominent peak. The mouth of the drainage, where it dumped into a wide-bottomed rubbly canyon, was a door into another realm. 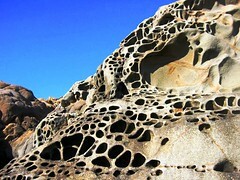 A tight entrance bracketed by rocky cliffs leading into a shadowy moist riparian strip. 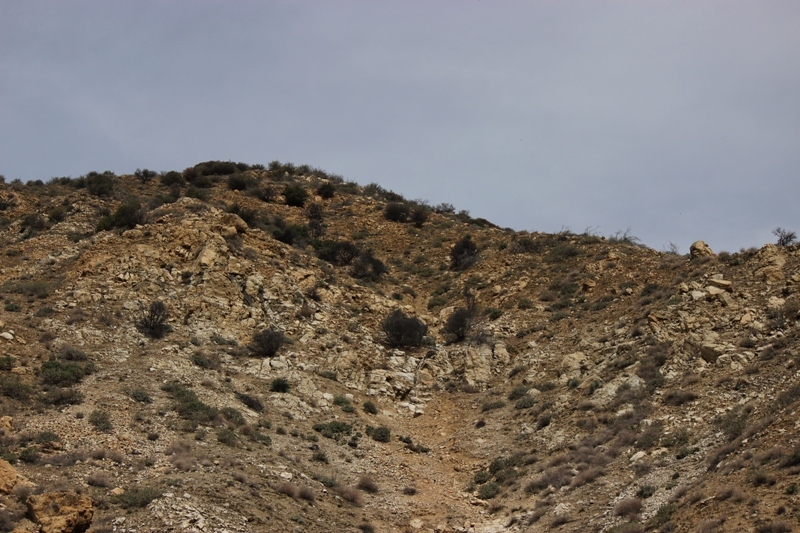 The surrounding terrain, by contrast, was barren, steep sloped, mostly broken rock and exposed loose soil with little vegetation. 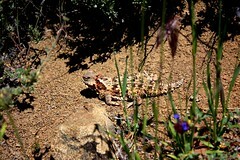 It was oddly bare in its nakedness relative mountains nearby covered in dense chaparral. That’s one reason why the quarry we were after lives there. The open landscape allows the sheep to better see predators and the steep slopes aid their escape. No trail lead through the canyon. It was a wild land of bears, lions and bighorn sheep, where condors soared the thermals faraway overhead, mere dots of black ink against a blue canvas. We walked up the shady creek hopping from one side to the other stepping over the few inches of water trickling down the stony groove. 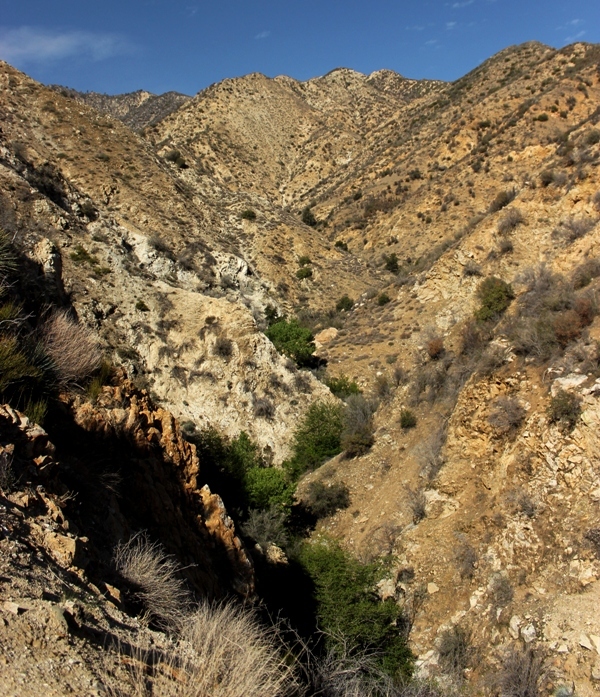 The zigzag riparian strip of Sheephorn Canyon. We were looking for an exit point out of the creek and up onto the mountainside. Somewhere we could manage to sit for two hours peering out across the vast space before us and maybe see something move out there. The land was rugged with few places to sit that had any sort of long view. In many sections the drop into the creek was sheer or too steep and rocky to scramble up and over. Getting out of the creek took effort and caution. 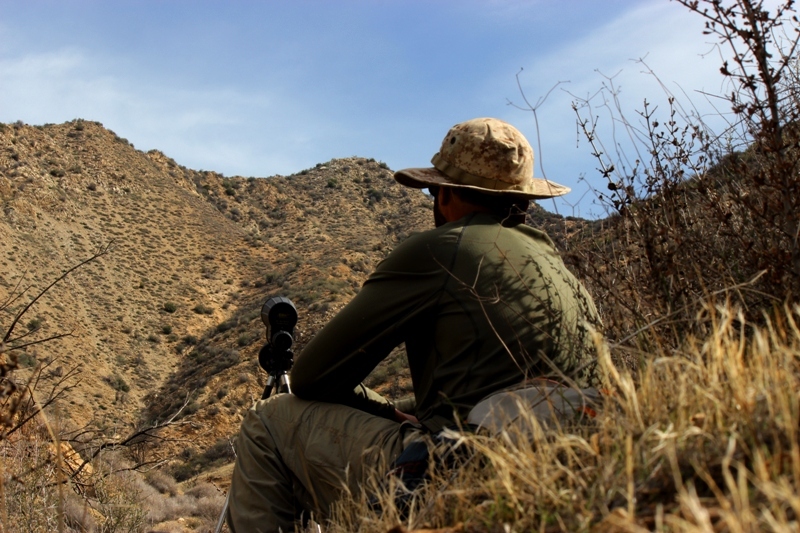 We were working for the California Department of Fish and Wildlife (CDFW) searching for a remnant herd of desert bighorn sheep. We had been brought together as volunteers through an invitation extended by a prominent frequenter of the local backcountry, a conservationist who puts in many hours of volunteer work bettering the national forest in various ways. He was leading this outing and was sitting somewhere on another ridge also searching for the bighorn as we three settled in for our morning round of surveillance. Our assigned duty was to sit for two hours glassing the mountain slopes for sheep, note how many we saw, if any, and their presumed ages as identified by the size of their horns or lack thereof. Our observational notes and photos would later be forwarded to CDFW officials for analysis. 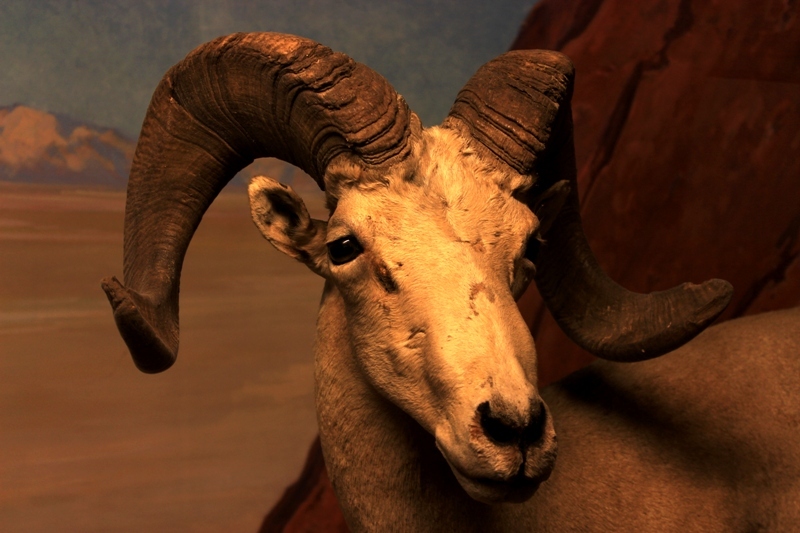 I had never seen a live bighorn sheep, just the stuffed specimens in the Santa Barbara Museum of Natural History. I had only learned of their presence at this particular location relatively recently. Not long before first learning bighorn lived in the local forest I had taken my young daughter to the museum and stood before the stuffed sheep. I had looked at it many times through the years on numerous visits, but it was a different experience this round. 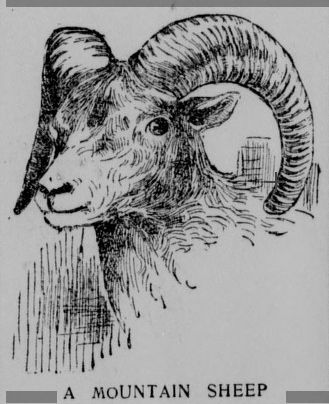 An illustration from an article entitled, “Shooting Mountain Sheep In Lower California,” published by the Los Angeles Herald in 1897. It had always been just another exhibit to glance at like so many others, never captured my attention much. This latest time, however, seeing the exhibit through a child’s eyes, I no longer only understood in a remote abstract sense how these large animals had disappeared from the mountains, but felt for the first time a sense of loss and lament unlike during other visits. I pondered what had been seized and snuffed out by previous generations. There was the ill-considered actions of otherwise decent people. But there was also the plundering, the rapacity, and the ruthless indifference by others. Fleeting actions by a few that forever altered the course of history for all others and life on the planet. I thought of what we of later times had lost. I felt a deep sense of regret that my own children, through no fault of their own and without their having any say in the matter whatsoever, would never see the bighorn when hiking in the wilds of their own extended backyards. It was if I had brought my daughter to this illuminated glass case to view a treasure that had been stolen from her. It wasn’t a celebration of the wealth of natural history. It was a memorial. It wasn’t a museum. It was a mausoleum. The plaque on the exhibit was an obituary. It was a hall of holocaust where people spoke in whispers and filed through to catch a glimpse of an extinct specimen of humanity’s relentless massacre. A dark record of civilization’s collateral damage. The stuffed sheep stood behind the glass as a silent testament. The heavy door, the weight, having to heave it open to leave the stale confines of the dark-colored room, it seemed fitting. When I later learned that the bighorn were not in fact regionally extinct I was stunned and thrilled. 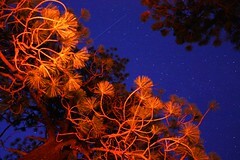 When I was subsequently recruited to venture into the forest and find them I could hardly wait to get out there. 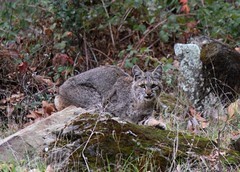 I need little reason and an even smaller excuse to get out into the backcountry bushes. The thought of hunting down wild bighorn sheep from a remote base camp provided a surplus of stoke to fuel the long arduous hike alone through the heat of the day, to reach the camp, and meet up with the select group of other volunteers. And when finally out on the mountain, the tedium of sitting for hours glassing the distant slopes was erased by the sense of excitement motivating me to do all I could to spot, for the first time in my life, these magnificent curly horned sheep in their natural habitat, and not too far from my home. 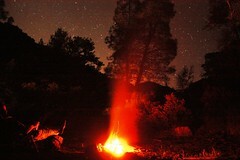 A photo of a hunting camp on Mexico’s San Pedro Martir Mountain. 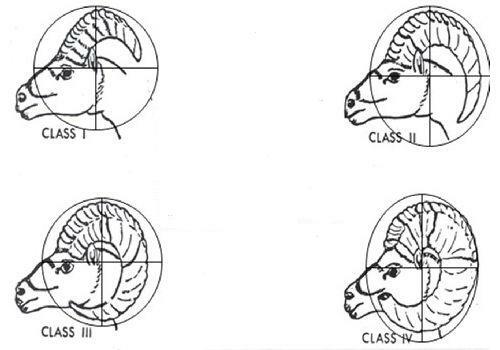 The image accompanied a story from which the following quote was excerpted, relating as it does one reason for the decline and disappearance of bighorn sheep in areas along the Pacific Coast. Twenty-five dollars in 1913 equates to about $600 today when adjusted for inflation. 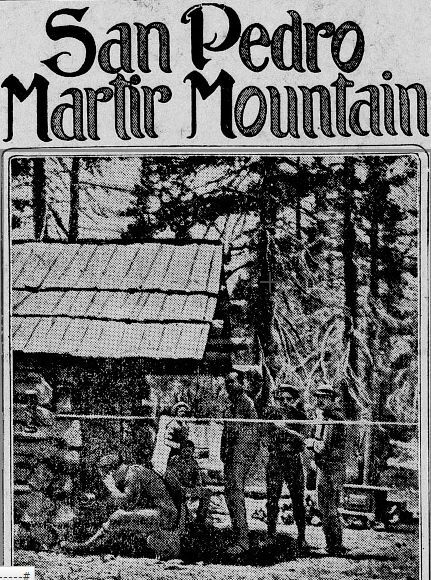 Other historic newspaper stories recount the exploits of Colonel Roosevelt, later elected 26th president of the United States, hunting bighorns in these same mountains. I had been sitting in silence for nearly two hours, though it seemed to pass rapidly, and I had not seen any sheep. My vigilant effort felt futile, like the old needle in a haystack exercise. Then I caught sight of several sheep walking over the crest of a ridge high above me. I thought of the odds of seeing so few sheep in so large a wilderness, and to have them appear as close as they did, and how I was fortunate enough to have been assigned to stake out this particular location, while the other few groups of volunteers had been placed elsewhere. Everything had come together nearly perfectly. I had separated myself from the other two men by ten yards or so and they had not yet seen the sheep. I started calling to them to get their attention by blowing breath across my teeth in such a way that was just short of a whistle. I didn’t want the sheep to hear or to frighten them so I avoided speaking, but mountain sheep are keen and naturally leery, having evolved to evade silent and stealthy predators like mountain lions. They quickly spotted me with their acute eyesight. I kept blowing, making the soft rustling sound, unable to get the two other guy’s attention, the sheep peering down directly at me from their high mountain perch the whole time. Later one of the guys mentioned that he heard me for some time before realizing it was me, and that I sounded something like a bird. We watched through binoculars and cameras. Ten or so sheep, young and mature alike, traipsed over the steep rocky slope cropping forage over a period of perhaps twenty or thirty minutes. They walked across the side of the ridge and then back from whence the came, ever vigilant, before disappearing from sight. One of the other guys jotted down notes as the other peered through his binoculars calling out the approximate age of the animals. I had my eye to my camera lens rapidly firing off photos. I had brought, aside from my SLR camera, a Russian-made spotting scope but it was too powerful to be of any use and did not have a wide enough field of view. I could not keep it pinned on the sheep as a group as they ambled about and I found it impossible to see much through the shakiness. 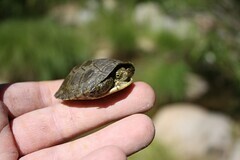 I decided that I would be of best use by taking photos I could later send to CDFW for staff biologists to analyze. There’s sheep on the slope, but impossible to see in this photo showing the landscape and habitat. 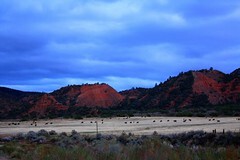 A closer view showing at least seven well-camouflaged bighorn sheep foraging. In late afternoon I followed one of the guys I worked with in the morning and we hiked off-trail up a steep, rocky mountainside above the small canyon we had previously staked out. He was a man whose name I’ve seen signed in at a remote mountain peak in the same region, a seldom visited site with no official trail and which few people have set foot on. I had been told his name is found on a number of other such out of the way, hard to reach mountain peaks and I had heard tales of this man from other local hikers. A picture of him had emerged in my mind as a hardened, stoic, grim character of middle age. When I met him I was surprised to see that he was an easy going, grandfatherly type quick to smile and easy to chat with. He was fit and able, and scrambled up the loose incline with remarkable dexterity for his age, fully clothed in long sleeves, pants and gloves, and with only his face peeking out from under the bill of his hat, a flap of cloth circling his neck. He seemed partial to covering every patch of skin possible. A choice, no doubt, based on the wisdom gained through hard earned backcountry experience, his clothing a subtle clue that his definition of “hiking” differed greatly from the average visitor to the national forests. I hoped to remain as agile as he was when I’m his age, I thought as we hiked up to a small bare nub of broken rock protruding from the shoulder of the mountain. There we perched for two hours like sentinels overlooking the deep cleft in the earth below us, and peering out over the valley-like canyon where our camp was located. I drew the circular brim of my hat down around the sides of my face to darken my peripheral view and kept my eye to the lens scanning the distant slopes for long periods of silent time. We exchanged few words, but the long silences were not uncomfortable. 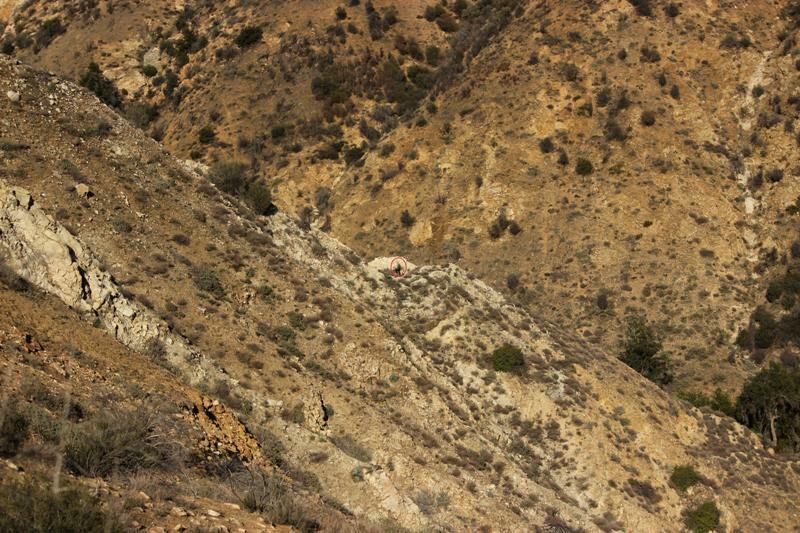 A member of the group out scouting for sheep high above the creek, center frame circled in red. It was challenging, in the tight canyon, without hiking clear up the mountain out of it, to find a spot up out of the creek that offered a view wide and long enough to actually be able to glass a decent sized expanse of terrain. We sat for two hours scanning the mountains and lo and behold near the end of this period of time I spied, on a distant slope, barely visible with the naked eye and hard to see even with my zoom lens, a group of bighorn sheep. Several guys in our group in the canyon below us had clued me in with their sudden chatter and pointing, but it took some time to finally spot the sheep. They seemed to be stuck to the wall of the distant mountain, their legs like pegs drilled into the earth, sharp-edged cloven hooves holding them in place. I saw the sheep, took my eye from the camera, and then looked back through the lens and couldn’t see them. They were there once more before again disappearing in plain sight. Their tanned-hued hides blended with the surrounding terrain making them nearly invisible from a distance and I wondered how long it took for this perfect color match between earth and animal to evolve. Once more I was feeling fortunate, ever more so, in having had the chance luck to spy yet again a handful of bighorn sheep on my first ever outing in search of them. Mission accomplished. Two sheep walked up and perched briefly on this boulder appearing to pose for the camera. This subspecies (Ovis canadensis nelsoni) is native to the area, but went regionally extinct about 100 years ago due to human actions, overhunting and disease introduced by cattle. 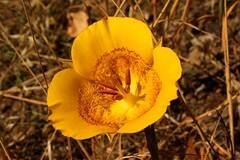 Their current presence in their historic range is the result of the CDFW reintroducing them several decades ago. Though many died and the initial effort seemed to fail, the sheep were tenacious and rebounded and increased in number. The story of these bighorn sheep is one of tragedy and triumph, disappearance and something of recovery, of the destructive force of some humans and those that work to restore and rebuild in the aftermath. In some manner the sheep’s plight is reminiscent of condors which also disappeared completely for a time in this same area due to humanity and were later reintroduced and once more repopulated. I wonder if the second chance desert bighorn sheep are here to stay or will merely be another short chapter in the long story of interaction between humans and wildlife. The answer mostly depends on the actions, for better or worse, and the interest and care or apathy and indifference of humanity. I believe this would be categorized as a class III desert bighorn sheep. 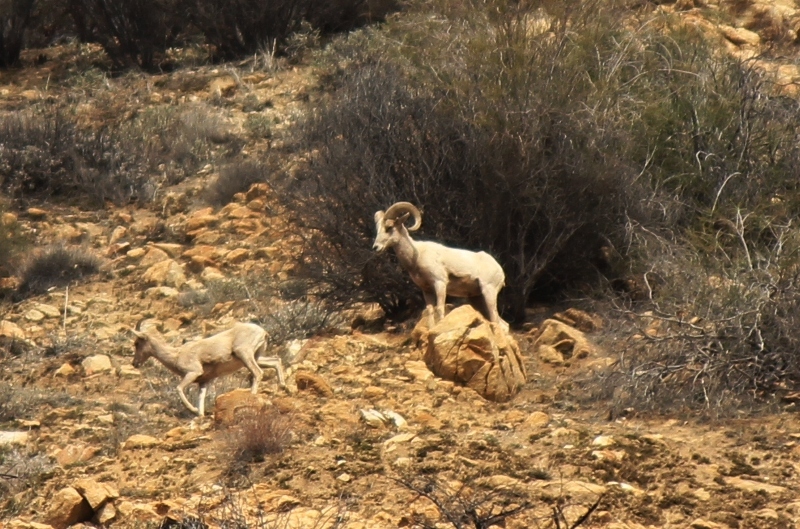 This entry was posted in Backcountry, Fauna and tagged Backpacking, Bighorn Sheep, Camping, Hiking, Hunting, longreads, Los Padres National Forest, Nature, Travel, Wildlife, Writing. Bookmark the permalink. Wow. So glad they are there and you were there to see it. Just listened to a great TED talk titled Animals and Us, which parallels this article and the sentiments about destruction of species. Thank you for writing such a wonderful piece about our local conservation efforts, it’s always a pleasure to hear from you about surfing,hiking or just your ruminations on life in and around Santa Barbara County. Nice write Jack! 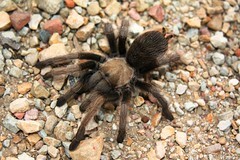 You are indeed fortunate to have had the opportunity to spot some of these guys. That last pic with the Class III is a sic shot; they do appear to be posing for you. 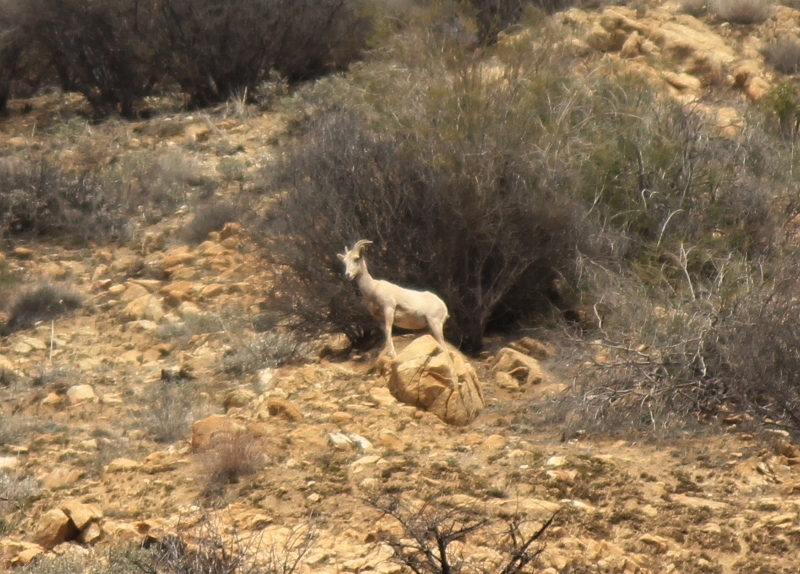 Viewing some local Desert Bighorn has been on my wishlist for quite some time.